Whenever tests are performed on fiber optic networks, the results are displayed on a meter readout in “dB.” Optical loss is measured in “dB” while optical power is measured in “dBm.” Loss is a negative number (like –3.2 dB) as are most power measurements. Confused? Many fiber optic techs are too. Let’s see if we can clear up some of the confusion. When we make fiber optic measurements, we are measuring the power in the light we measure. The standards we use for power measurements, maintained by NIST (the US National Institute of Standards and Technology,) are actually determined by the heating effect of the light as it is absorbed in a detector. Every fiber optic power meter sold is calibrated traceable to the NIST standard so different meters should measure the same power, within the limits of calibration uncertainty. Optical power in fiber optics is similar to the heating power of a light bulb, just at much lower power levels. While a light bulb may put out 100 watts, most fiber optic sources are in the milliwatt to microwatt range (0.001 to 0.000001 watts), so you won’t feel the power coming out of a fiber and it’s generally not harmful. In the early days of fiber optics, source output power was usually measured in milliwatts and loss was measured in dB or deciBels. Over the years, all measurements migrated to dB for convenience. This was when the confusion began. So 10 dB is a ratio of 10 times (either 10 times as much or one-tenth as much), 20 dB is a ratio of 100, 30 dB is a ratio of 1000, etc. When the two optical powers compared are equal, dB = 0, a result of the log scale used in dB but a convenient value that’s easily remembered. Measurements of optical power are expressed in units of dBm. The “m” in dBm refers to the reference power which is 1 milliwatt. 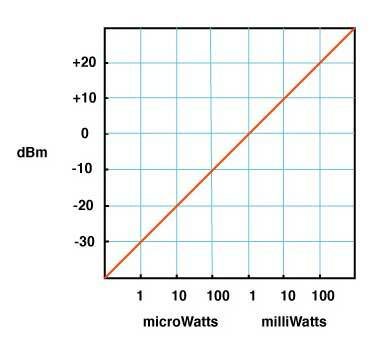 Thus a source with a power level of 0 dBm has a power of 1 milliwatt. Likewise, -10 dBm is 0.1 milliwatt and +10 dBm is 10 milliwatts. Instruments that measure in dB can be either optical power meters or optical loss test sets (OLTS). The optical power meter usually reads in dBm for power measurements or dB with respect to a user-set reference value for loss. While most power meters have ranges of +3 to –50 dBm, most sources are in the range of 0 to –10 dBm for lasers and –10 to –20 dBm for LEDs. Only lasers used in CATV or long-haul telephone systems have powers high enough to be really dangerous, up to +20 dBm – that’s 100 milliwatts or a tenth of a watt! The OLTS or the power meter on the dB scale measures relative power or loss with respect to the reference level set by the user. The range they measure will be determined by the output power of the source in the unit and the sensitivity of the detector. For multimode fiber, an OLTS using a LED source will usually measure over a range of 0-30 dB, more than adequate for most multimode cable plants which are under 10 dB loss. Singlemode networks use lasers and may have loss ranges of up to 50 dB for long-haul telecom systems, but campus cabling using singlemode may only have 1-3 dB loss. Thus a singlemode OLTS may be different for short and long systems.